Could go in freeze control shaman, if that ever becomes a thing. What does a C'Thun eyeball taste like? There are many 4 mana 3/5 minions from the next expansion. Someone mentioned freeze shaman - haha. That's funny. Though, I like the flavour of this card. When I look at this card, I see "anti-Freeze Mage tech." I mean, it's like two years too late, but better late than never...? I really like the card's artwork. 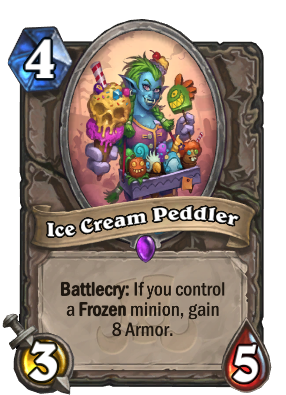 I can see an Annoy-o-Tron ice cream, another looks like Sherazin. One looks like something from Plants vs Zombies (behind the Sherazin ice cream). Another looks like the Hearthstone swirl. I can also see a C'Thun eyeball and a Mana Crystal. The effect is interesting, but I don't think it will proc most of the time. Oh kinda unrelated but have u tried PvsZ Heroes ? Left over from Frozen Throne. How cute. Freezing your own dudes is never worth it, not even for 8 armor. 10/10 falvour tho. That was also my first thought, counter to the classic freeze mage.